The keen eyed out there might notice its not all the same model! The lovely Anna in pastel pencil. This surprised me when I looked back at it the next day, the model looks rather Amazonian but in fact Morag is very petite. I'd realised half way through that session my arm was really aching because I had the easel too high, and that's the reason for the skewed proportions I think. Lesson learned although you never know when you might need an amazon - ha! This was done done using the continuous drawing method, not taking the pencil from the paper. You start off lightly marking the paper, not worrying about crossing over the form and then you gradually get darker as you become more sure of the marks. Its supposed to help with your proportions especially the horizontals and having never done it before I quite enjoyed it especially as it more scribbly than I usually work - rather liberating. The lovely Anna again - model, tutor and artist. Its not just co-incidence that everyone produces good work when she is in the room. 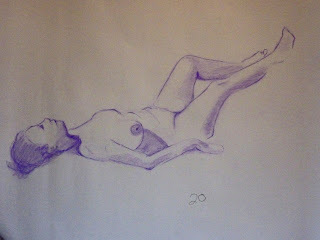 Fabulous life drawings, Tina, I love your decapitated woman, she is great! In fact, heh, I love your entire blog, I shall be kept quiet for a long while reading your previous posts and by following all the links. Hey thanks for dropping by Rolina, I'm thinking decapitated, handless, footless people are the way forward in life drawing - ha! Yes, some of my links are really good, I lose myself in them for far too long but its very addictive this art lark. See you on your blog and WC.